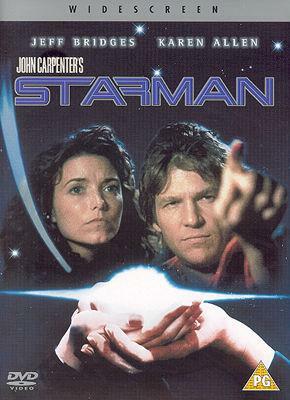 This sleeper from John Carpenter is a classic from the 1980's era about an Alien intelligence taking life of a beloved husband with all round good performances. The state of art in visual effects lead in co-production by Industrial Light & Magic has kept the look of the film timeless. A beautiful score by Jack Nitzsche best heard on the end credits so roll out the tissues it's a weepy one. 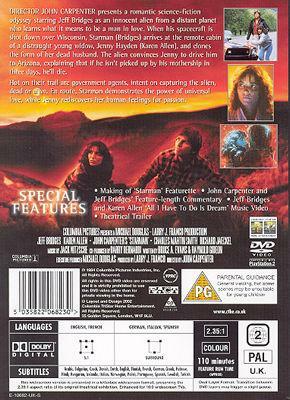 Picture is sharply reproduced on this region 2 DVD with good framing of the 2.35:1 Panavision format colours are full of depth and richness. Sound originally released in 70mm six-track Dolby stereo A type the transfer to DVD is nothing more than perfectly complex which needs good matching fronts set at the correct height and width across the front to deliver some off screen sounds subtle types like when opening a glove compartment or switch on the radio when Jennie and Scott travel towards Arizona for his rendezvous with mother-ship. LFE.1 is used sparingly but its must effective due the landing at the meteor site in Arizona.